For one Orange Street girl, the best birthday present of all was gift to others. Instead of presents for her birthday, Tori Ross, 11, asked for donations to the Geisinger NICU hospital. That is where babies who are sick or born too early get fixed. Tori’s birth was a miracle. She born early but survived. “I’m donating to the NICU because they took care of me when I was a baby,” Tori told the News. 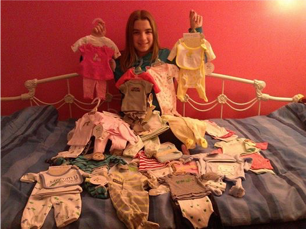 Tori, who was born a couple of months early, was able to raise $662 to buy baby clothes and gift cards for tiny babies. “I’m so happy, to be able to help,” said Ross. “I can’t believe how generous everyone was,” said Ross. This entry was posted on January 29, 2015 by Hilde Kate Lysiak and tagged nicu, Orange Street News, selinsgrove, tori ross.